dirty towels, which are not suitable for use anymore, on the floor or the bathtub rim. 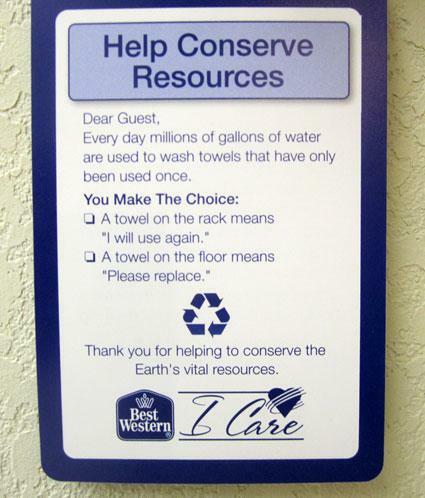 Hotel owners and managers are well aware that this can help save some energy and water. Apparently this is a minor, but not a negligible saving, considering the number of all the hotel rooms and the fact that hotels operate 24 hours a day and 365 days a year. 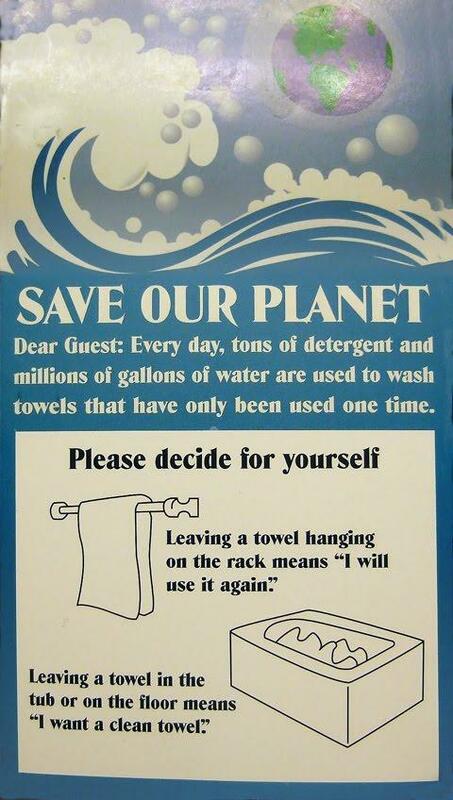 Therefore, a great number of towels did not need to be washed and no water and electricity needed to be used for them. Many small savings together make a large financial saving and a big difference for the hotelier. 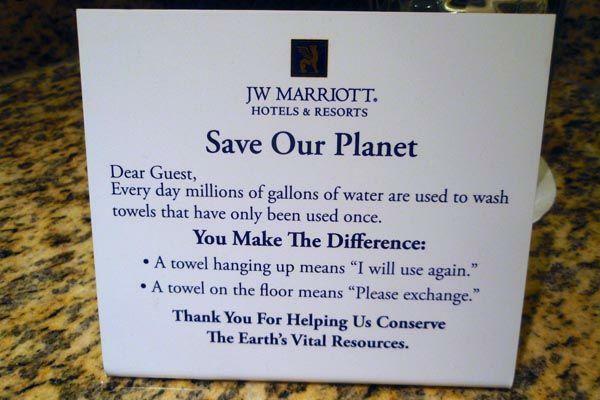 The idea is simple, since the ROI (return on investment) of such a simple solution, like a sticker in the hotel bathroom, can probably be achieved in less than one month. At Andivi we had the idea to help hoteliers save with a special sticker, placed beside the thermostat, informing guests about energy consumption or the optimisation of energy used for air conditioning in the summer and for heating in the winter. This way we would try to mirror the common towel practice on thermostats. By simply informing the guests about how a change of temperature influences energy saving, the ecologically friendly guests will think twice before changing the temperature on the thermostat. The aim of this sticker is to influence the guest to change the thermostat temperature only when necessary. The sticker encourages the guest not to change the temperature on the thermostat and to leave temperature regulation to hotel management. The management sets up a pleasant temperature of 21°C – 22°C, a temperature range, optimum for comfort as well as energy consumption. Let’s take a look at a typically summer scenario. The guest first arrives to his hotel room, which has a normal or maybe a slightly higher temperature around 23°C to 24°C in the summer. Since he/she finds the room too hot, he/she will immediately lower the temperature. However, there is a great danger that he/she might set the thermostat to the lowest possible temperature. This is a result of a misconception that the lower the temperature on the thermostat, the sooner the room will become cool, which is not true. when guests arrive in a room with slightly cooler temperature and set the thermostat to maximum temperature in order to heat the room more quickly. Afterwards, when the room gets too hot, they start opening windows to lower the temperature. This doubles hotel’s energy costs, as the room was first unnecessary heated and then cooled by opening the windows, instead of lowering the temperature on the thermostat. The belief that a room will become warm quickly, if the thermostat is put on maximum, or that it will take less time to become cool if the thermostat is on minimum, is a misconception. The temperature and the speed of heating or cooling do not increase linearly, although, for some reason, this kind of thinking is intuitive to people. Our experience and thermostat data prove that most people do not know this and therefore contribute to unnecessary energy spending. This sticker would be placed next to each thermostat in every room. We are convinced that the ROI for this sticker is at least as excellent as the ROI for the sticker, trying to reduce the number of towels that need to be washed and dried daily. Placing the sticker next to thermostats might even save more energy than the towel sticker, since hotel guests will no longer set the thermostats to minimum or maximum temperature. As a little surprise, Andivi has decided to put the idea into practice. From today, the sticker is available at Andivi! 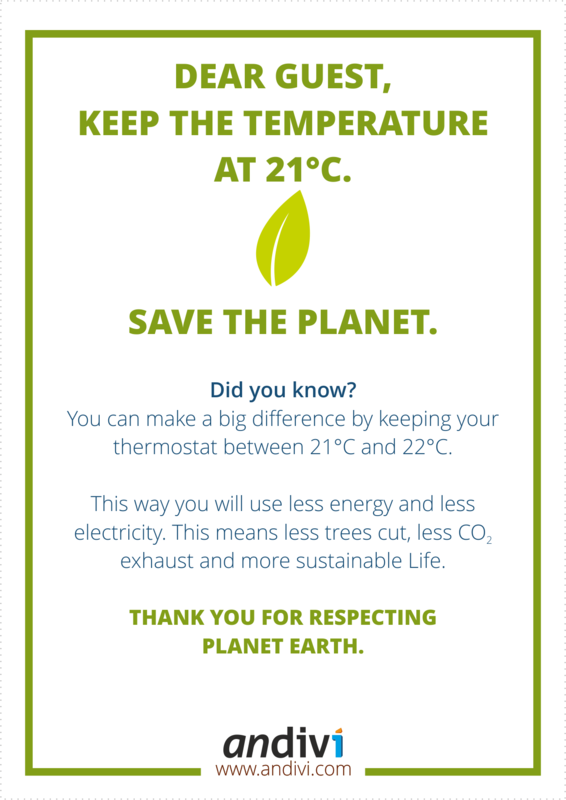 You can download the hotel thermostat energy saving sticker free of charge and print it. It is available in Slovene, English, German and Croatian. Or you can order it physical form. For clients, who would like a sticker in their corporate visual identity (in their typical colours and typography) with their hotel logo, we can make that happen. Send us your wishes and ideas to info@andivi.com and we will individualise the thermostat sticker to meet your requirements. We firmly believe that besides thermostats, controllers, hotel door strikes and intelligent regulation, this kind of stickers can also help our clients reduce energy costs.